Register for CPR and AED in Windsor, Ontario with Windsor First Aid. Learn the latest CPR and lifesaving rescue techniques by enrolling in a workplace approved first aid and / or CPR course with this proud St Mark James provider. 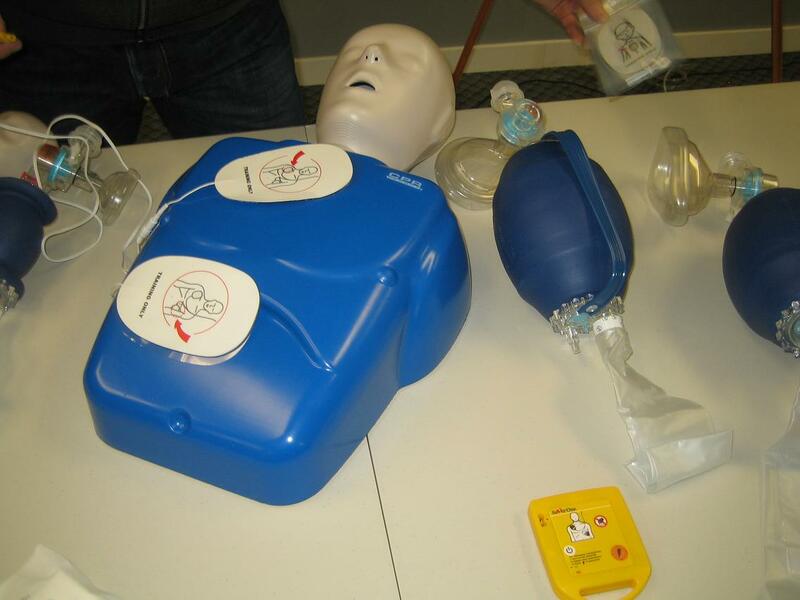 All first aid and CPR classes include training in the use of automated external defibrillators (AED). These popular life saving machines dramatically increase survival rates for victims of cardiac arrest and other serious cardiac emergencies. This provider teaches the latest standards in CPR rescue techniques because it follows the standards provided by the International Liaison Committee on Resuscitation (ILCOR) which is the leading / guiding body on CPR and resuscitation techniques in North America. Windsor First Aid provides the highest number of courses, with the most experienced teachers and at the lowest prices. Participants that complete first aid, CPR and AED courses in Windsor will receive workplace and academic approved certifications that are valid throughout Canada. To visit this first aid and CPR provider Click here. You can also contact this provider using the following email: [email protected] or visit the website at www.firstaidwindsor.ca. First Aid and CPR training supplies for standard, emergency and childcare first aid courses. Courses can be partnered with CPR level “A”, “B”, “C” or “HCP” and AED. Due to the competitive nature of the training service provider market, Windsor First Aid offers only the latest information on Basic Life Support (BLS), of which CPR and AED use are vital parts after recognition of cardiac arrest. All training course levels for CPR are inclusive of AED training. AEDs have now become commonplace as survival rates of victims increase with CPR and defibrillation within 3-5 minutes after collapse. Windsor First Aid ensures that you will have the best training in response to varied emergency situations. Training courses are divided into levels “A”, “C”, and “HCP”. CPR Level “A” offers basic CPR and AED training for adult and child victims; CPR Level “C” offers basic CPR and AED training for adult, child, and infant victims, along with basic first aid; and CPR Level “HCP” which offers comprehensive CPR and AED training for health-care providers. Windsor First Aid offers the least expensive fees on all training courses and programs. Rates are inclusive of taxes, certification, and St Mark James administration fees. You can be sure that no “invisible fees” are accrued to your account as all expenses are itemized and discussed explicitly with the trainees. No other St Mark James provider offers more instructional classes over the week than Windsor First Aid. Trainees have a large selection of class schedules available to them throughout the week. Private classes are also offered for trainees or groups who wish to have exclusive training sessions with Windsor First Aid. Cancellations are rare in Windsor First Aid’s class track record. Classes on basic first aid or CPR and AED training only are available for trainees who do no wish to undergo the full training course. The newest classes offered by Windsor First Aid are food safety classes that are applicable for home and commercial food safety. The video below showcases some of Canada’s newest food safety laws which will be covered in Windsor First Aid’s classes. For trainees who want to renew expiring or near-expiry certification, refresher courses are offered at Windsor First Aid at least twice a week. Certificates for first aid, CPR, and AED that are valid for 3 years are given to trainees who are able to successfully complete a training course. Windsor First Aid provides a variety of training centers in different locations. All of these training centers are comfortable, clean, and offer a relaxed learning environment with high end equipment. You can be assured that the training staff at Windsor Fist Aid are the most accommodating to trainees, easily-approachable, and are the best in their field of expertise. Trainees who enroll at Windsor First Aid will receive the best education for first aid, CPR, and AED. Register for a CPR and AED course today to learn the skills to save a life during an emergency. 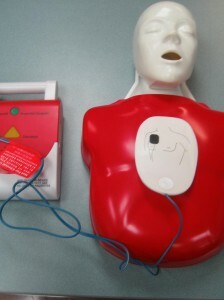 Become a part of the chain of survival by knowing how to use an AED and by being able to apply the latest CPR techniques. Rescuers can perform ventilation with a bag and mask with either room air or exygen. A bag-mask provides a positive-pressure ventilation without the use of an advanced airway such as an endotracheal tube or tracheal tube through a tracheostomy, so inflation of a stomach may be an unwanted effect if the head is not properly positioned. Masks should be transparent to allow rescuers to detect instances of regurgitation, and form a tight seal around the mouth and nose. 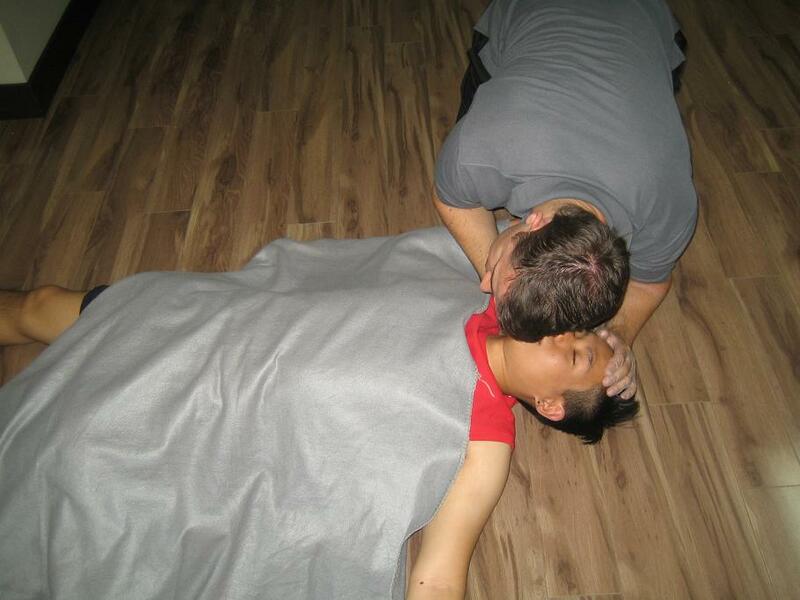 If a victim has an advanced airway, no breaks during compression are done when the rescue breaths are given. Sign-up for first aid and cardiopulmonary resuscitation education with Windsor First Aid to acquire the very best quality St Mark James and food safe classes at the most competitive fees. To learn more or to enrol in a re-certification or full training course go to the Windsor First Aid Web-site right now!